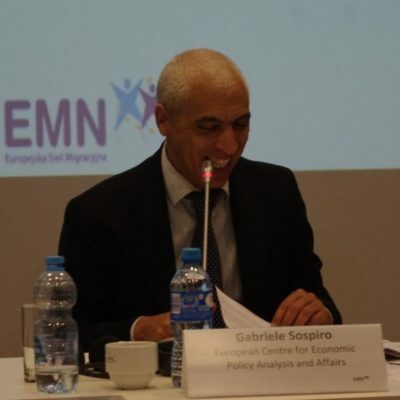 Gabriele Sospiro is the founder of ECEPAA (European Centre for Economic and Policy Analysis and Affairs) a Brussels-based organization. He obtained a PhD in Social Science from the University of Urbino, Italy in 2001. He has been a visiting student a University of Pennsylvania in the US. He is a senior specialist in policy areas such as African institutions, migration, employment, education, labour markets and youth with migrant backgrounds. He has solid experience in managing European projects since 2000 and has researched the issue of migration extensively. He is lecturer in different universities and is the author and co-author of several articles and books related to migration and youth policies. Over the last years he hosted several young entrepreneurs.